Peer to peer recognition is as important, if not more, than recognition coming from top level management and leadership. Allow your employees to nominate and highlight the excellence within your team – as it is them who sees the day-day achievements first handed. This not only highlights the fact you value and respect your team, but shows a level of trust and commitment too. Let employees nominate the team for both financial and non-financial rewards, everything from a simple thank you card, a gift voucher for their favorite retailer, an extra day’s leave or an experience day. 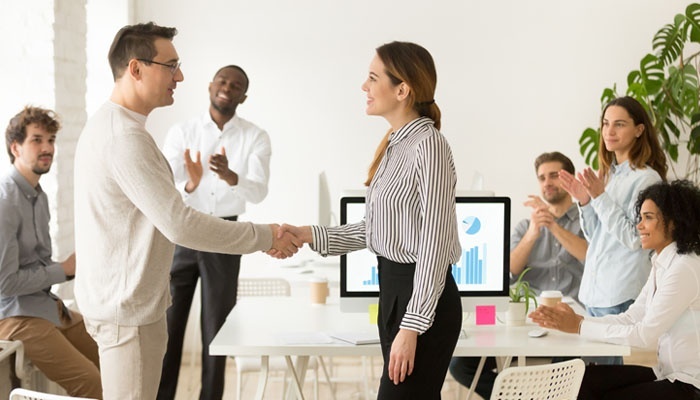 Face to face presentations are one of the most effective ways for this social recognition, so present the reward in front of the department – this will ensure the recognition for their hard work is shared amongst the team and well received. It’s imperative to build a culture of continuous recognition across your business, encourage your team to get involved. Using automated systems to recognise employees can significantly decrease the time it takes for them to receive credit for their achievements. Gone are the days when acknowledging a team member for a great job should be an admin mountain and shoved to the bottom of the priority list. Whether it’s an announcement, a simple thank you or a pitch won, having the processes in place speeds up the procedure and shows management is on ball, as well as significantly decreases the likelihood of it being forgotten at the next quarterly meeting. Instant recognition also carries an element of surprise and excitement, and often makes whatever is being rewarded more likely to be repeated in the future. It’s no secret that retaining your employees saves an organization a considerable amount of money in the long run, so it’s always a great idea to ensure your good staff want to stay put. The days of giving a carriage clock or a gold watch are long gone. The rewards offered to celebrate long service need to be flexible to cope with that of a diverse, ever-changing workforce. Formalizing these employee recognition incentives or milestones can encourage staff to remain in your business, if desirable. The rewards need to be attractive and sought after, and companies should offer a broad package for employees to choose from. Companies can also look to implement these long service awards at 3 years and 5 years as opposed to only 10 and 20 years. It may sound simple, but saying thank you, as well as encouraging your team to do the same, can be one of the most effective way to recognise your employees for all their hard work. Integrate E-thank yous into your reward and recognition programs, as this is an easy way to demonstrate appreciation as well as give the impression that someone has taken time out to recognise hard work. E-Thank yous are easy to send as well as share to the wider team to make them aware of a particular achievement – all at the click of a mouse. Companies can also use programs like Yamma to publicly thank high achieving members of the team – simple, yet powerful! Reward and recognition should not follow a one size fits all approach. Take into account the demographics, geolocations and lifestyles of all your employees. What appeals to one, may not appeal to another. When creating the rewards you’ll be offering for recognition, choose useful and desirable awards, accommodating for a diverse workforce. Understand what you’re employees want. Often extra annual leave as a work-related benefit would make an employee feel the most loved. Often a bespoke, personalized award is more valued over money. Companies can also stagger different reward options for different levels of achievements, for example a £10 gift card for a project well done, and a spa voucher for working overtime to complete a time pressing task. Employee reward and recognition needs to be about reinforcing organizational culture and it’s values. Linking recognition rewards directly to your company’s values will ensure that your employees are engaged for the right reasons and in turn, that will benefit the business and continue to reinforce the culture. Rewards should be clearly linked to an organization’s core behaviours, so companies need to start by answering the fundamental questions of what are the organisation’s goals? What are the goals of it’s recognition strategy? Why does a company have certain rewards? These answers will help shape how the programme will look. There is a continuum of solutions in the market, so it’s imperative to ensure that it’s accurately aligned to your business. To find out how to build an effective Employee Reward and Recognition Strategy, download our free e-Book and case study.